Saturday, Nov 24th 12:00 till 5:00pm. Sunday, Nov 25th 12:00 till 5:00pm. Tuesday, Nov 27th 12:00 till 5:00pm. Wednesday, Nov 28th, 12:00 till 8:00pm. Thursday, Nov 29th, 12:00 till 8:00pm. Friday, Nov 30th, 12:00 till 8:00pm. Sunday, Dec 2nd, 12:00 till 5:00pm. Santa Day at the Fantasy 1:00 – 3:00pm Take a picture! Win a prize! 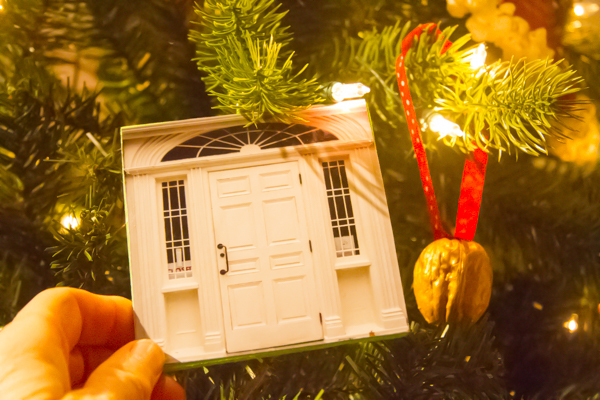 Monday, Dec 3rd, Museum Closed. Tuesday, Dec 4th, 12:00 till 5:00pm. Wednesday, Dec 5th, 12:00 till 8:00pm. Thursday, Dec 6th, 12:00 till 8:00pm. Friday, Dec 7th, 12:00 till 8:00pm. Saturday, Dec 8th, 12:00 till 5:00pm. Sunday, Dec 9th, 12:00pm till 4:00pm. Draw commences 4:15pm. 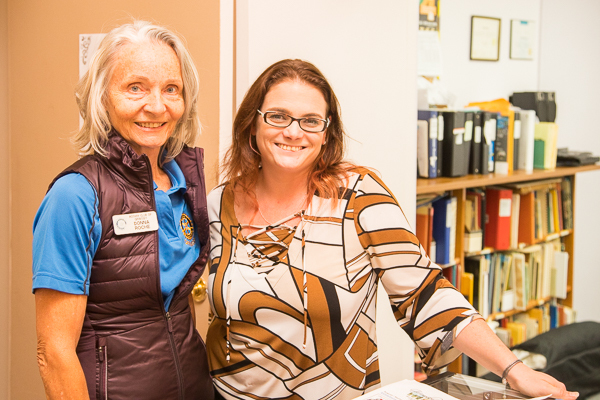 Open Doors Grimsby yesterday – here is Donna Roche with Grimsby Museum Curator/Director Janet Oakes. Over 200 people visited the Museum. 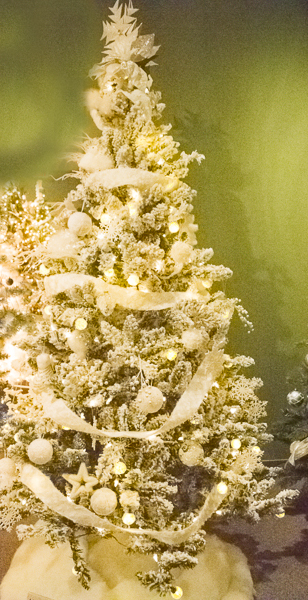 Donna let everyone know about the Fantasy of Trees Nov 23 – Dec 9 2018. What is the Fantasy of Trees? 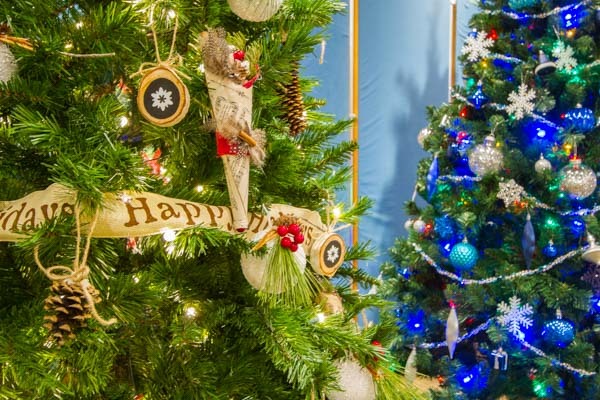 The Rotary Club of Grimsby hosts the Annual Fantasy of Trees for 2 weeks from the end of November to December at the Grimsby Museum. We create a fun-filled wonderland where everything is won in the raffle or auctioned in the silent auction! Everything goes to a home! Everyone has fun! And our local charities receive the funds! What better story is there. Join the fun – be a sponsor, be a volunteer and be a visitor! 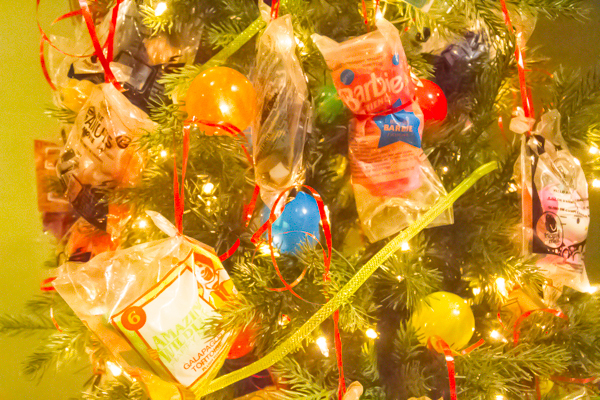 There were a lot of votes for our Favourite Trees this year. Thanks everyone who voted!. Congratulations! First Place: “A Snowy White Christmas” Sponsored by Royal LePage Niagara Real Estate Centre and decorated by Kerry Vandermolen. 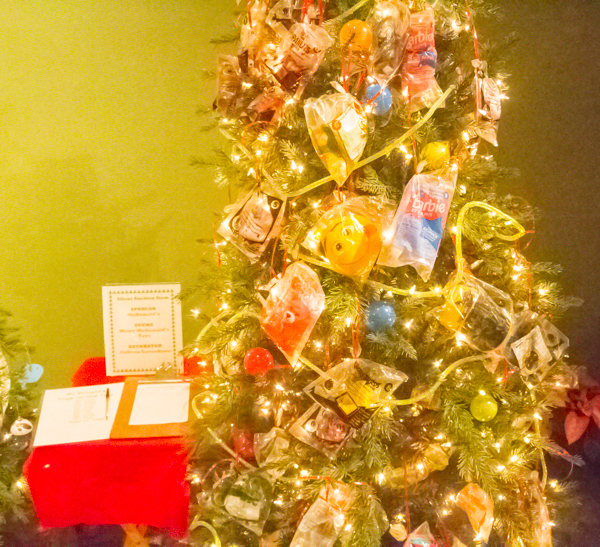 Third Place: “The Merry Chocolate Christmas Tree” – Sponsored by Chimney Top Masonry – decorated by Shelley Sandwell and Marie Solvason with ornaments from our own Monks Chocolates! We are very proud of your support of our community! We’ve raised $17,000 this year! Each year, free of charge, several thousand adults and children attend the glorious, twinkling display at the Grimsby Museum. The Fantasy of Trees raises money through a lottery of raffle ticket sales, and with a silent auction. 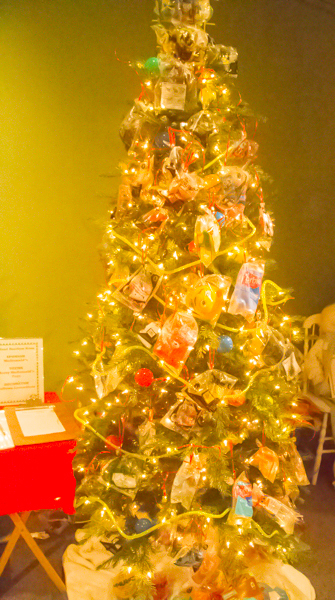 Raffle tickets mean that the decorated trees and other holiday items are won by our Fantasy visitors and participants. Everyone wins! Proceeds support local charities and Rotary causes, including local scholarships. Our recipients are listed on our website. Thanks to our lead sponsor Performance BMW and to our more than 100 sponsors who donated trees, wreaths, urn insets and raffle items to make this such a great success. The Door to the Grimsby Museum on one of our 2017 trees. There are two trees that are available for bidding in the auction. Check them out! 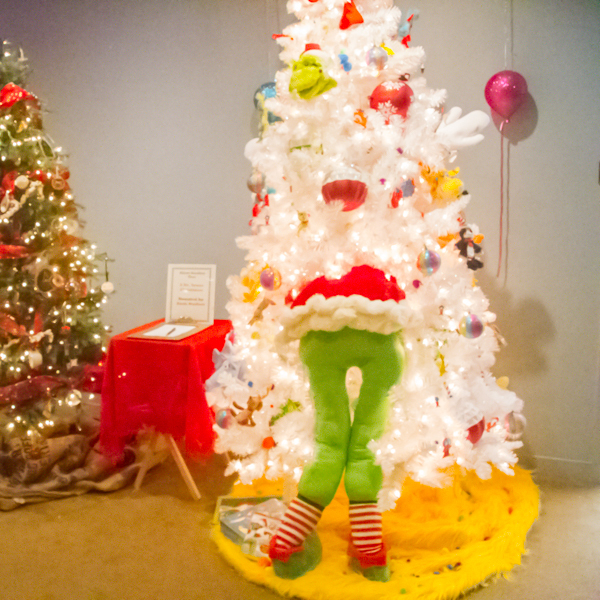 Here’s Ruth Moffatt’s creation – A Dr. Seuss Christmas. It is decorated by Ruth Moffatt and Audrey Robinson. 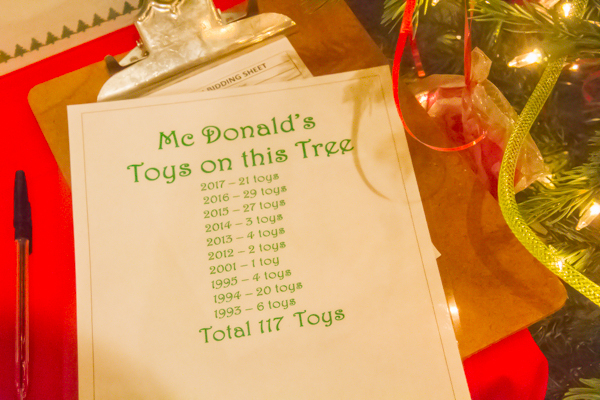 This is the McDonald’s Toys Tree – the tree is decorated with toys collected by Colleen Laverdiere. Colleen’s the decorator as well. Reindeer Family is back this year! 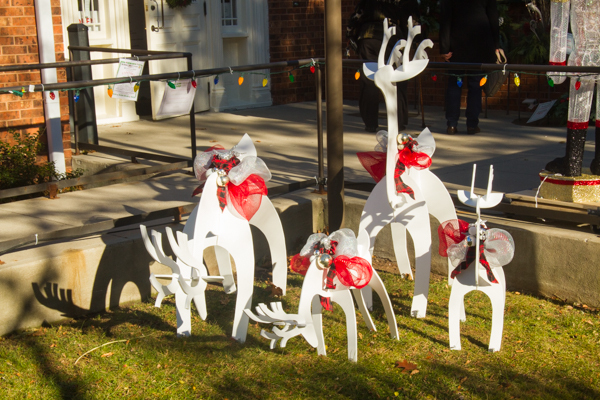 Marie Solvason has created another reindeer family for this year’s Fantasy – you can take this family home by bidding in the Silent Auction! Come for a visit to see the beautiful trees, wreaths, outdoor urns, raffle and silent auction items. Lots of fun for everyone! 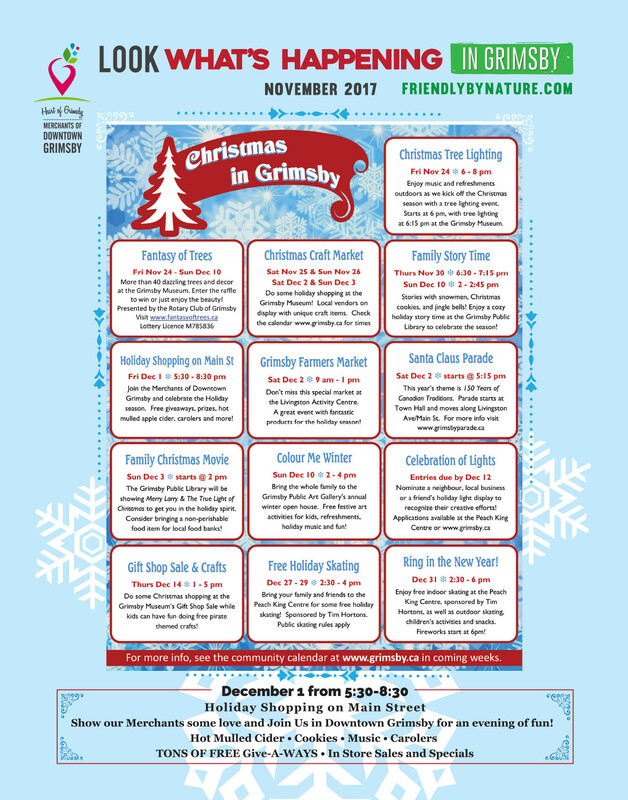 We want to share the wonderful Grimsby Calendar of events! We want to correct the Saturday Hours for the Fantasy. Come see the trees and visit the Christmas Market this Saturday and Sunday. 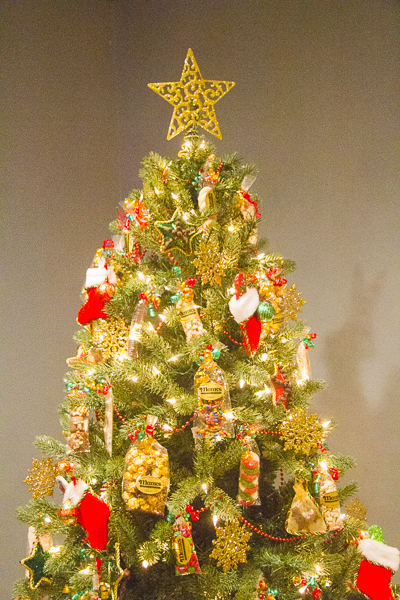 “Last Holiday season, the Fantasy of Trees was very generous and donated a fully decorated tree to one of our residential clients. This was particularly meaningful to her for several reasons. She is the mom of 3 children under 12; this was the first Christmas that she would be spending the day with them; and the first Christmas tree that they had ever had. Her abuser had always forced her to work on Christmas day and never allowed them a tree. We hope that you visit the Fantasy of Trees this year and support West Niagara Second Stage Housing & Counselling and all our recipient organizations with your purchase of lottery tickets.